Who knew we could hang so hard? Bill and I are SO READY to hit up the clubs once little Caleb learns how to have a good night’s sleep. 3AM is PARTY TIME FOR US! Woot! Woot! But then we get a moment like this – where Caleb is sleeping and dreaming of eating. 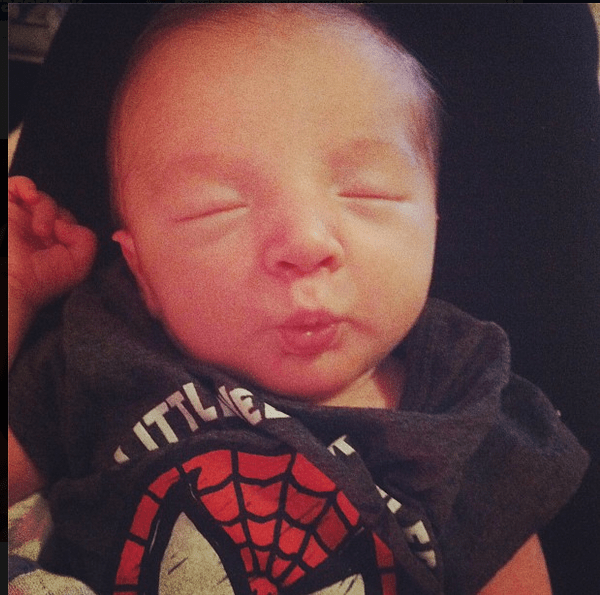 He puckers up his lips and I want to dive right in! But I’m afraid because of all the sickness that is going around. So, I’m avoiding his lips for the time being (no matter how tempting they are) and instead am concentrating on his cheeks and head. Oh how I love this little boy. I will say that we are SO LUCKY that Bill works from home with me because otherwise I would be institutionalized due to lack of sleep. I don’t do well when tired… and I really mean that. Bill takes the 8PM and 11PM and I sleep. Then when it’s around 2AM, I am ok with getting up to handle the baby. Yes, I just said I go to sleep at 8. It’s true. Not ashamed about it either! Sometimes the kids tuck ME in. LOL. They get a kick out of that. But like I’ve said before – it’s all par for the course and I wouldn’t have it any other way. AWWWWWWW he’s truly adorable! God bless!